The allotment plan just issued by the governor buys a little time with mostly short-term budget fixes to get Kansas through fiscal year 2015. 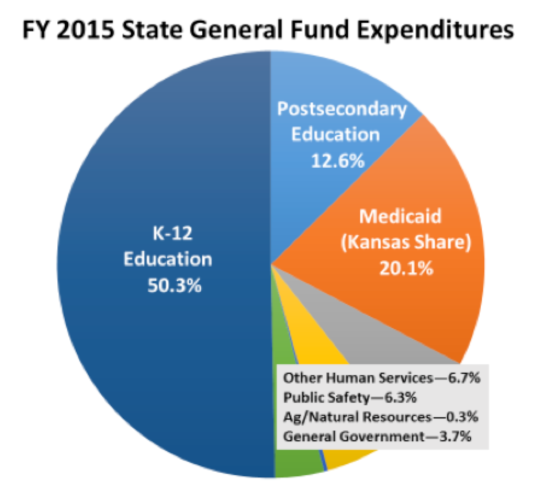 However, the plan does little to alter the main dynamic at play in the Kansas budget: Even though the current set of expenses are lean, they far exceed a diminished revenue stream. Under the governor’s plan, by using up the beginning bank balance, raiding other funds, and making some spending cuts, the general fund will finish FY 2015 with a zero balance — the bare minimum. That moves the focus for the state’s budget problems squarely to FY 2016. 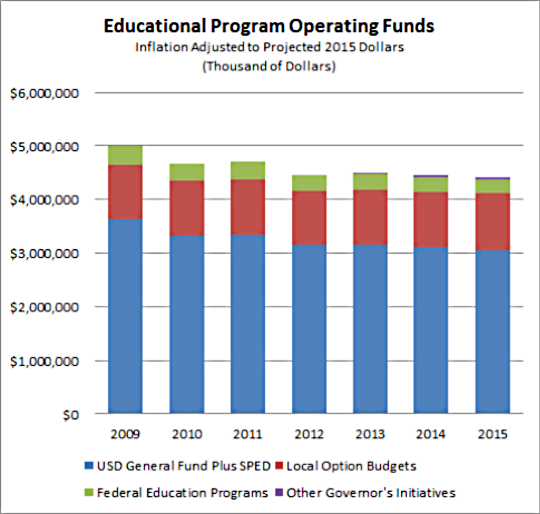 The general fund profile below shows the new outlook for FY 2016. Without new revenue, lawmakers will need to cut approximately $669 million just to keep the general fund solvent in FY 2016. That would be more than a 10 percent cut to every single item, on top of the cuts the governor already imposed in FY 2015. Lawmakers had better find a way to increase revenue, or the cuts to education and other state programs are going to be deep and highly distressing. 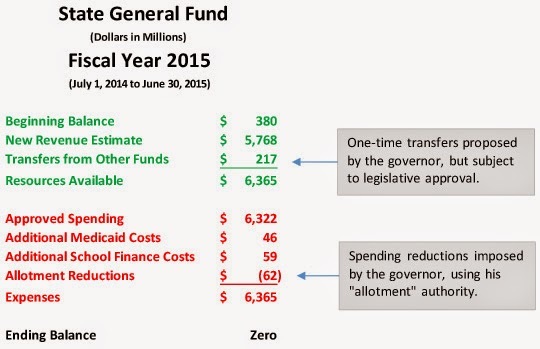 * Some of the expenditure "cuts" shown in the governor’s plan are actually revenue transfers to the general fund. For example, Dept. of Transportation expenditures are cut by $7.8 million, which benefits the Highway Fund, but the savings from the Highway Fund would be transferred to the general fund if approved by the Legislature. Lawmakers have quite a job awaiting them. During the next legislative session they must first fix the existing FY 2015 budget, and then look into the future and create new budgets for FY 2016 and FY 2017. None of it will be pleasant. Fiscal year 2015 (shown below) is almost half over. 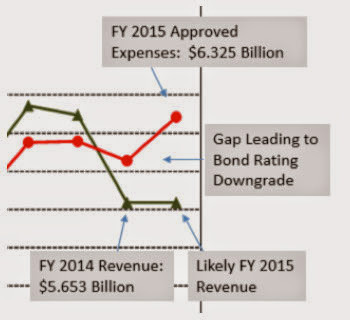 Expenses total $6.427 billion, but estimated income only reaches $5.768 billion, leaving a $659 million gap to bridge. A portion of that gap can be closed by using up the $380 million that was in the bank at the beginning of the year, but that still leaves another $279 million to go, just to get to an ending balance of $0. Zero is the minimum balance. It should actually be much higher. State law and financial prudence require an ending balance equal to 7.5 percent of expenses — about $500 million. However, that’s an impossible goal for this year. Just achieving a zero balance will not be easy. The Speaker of the House and several other lawmakers have announced their intention to solve the problem with spending cuts alone. That almost certainly means cuts to public education. Kindergarten through 12th grade education accounts for over half of general fund expenses. Medicaid, an unrealistic area for reduction, accounts for another 20 percent. Without reductions to K-12 education, the cuts to the remaining portions of the budget — higher education, other human service programs, and public safety — would be impossibly deep. Other legislators have expressed the hope that revenue will turn out to be better than estimated. Not likely. The current FY 2015 revenue estimate was dramatically revised downward after the elections, but may still be too high. Many budget watchers are predicting that a transfer from the Highway Fund will ultimately be used as a short term repair to the FY 2015 budget and a way to avoid education cuts. A $279 million transfer would require cuts to road programs, but the transfer would count as a revenue increase to the general fund, allowing FY 2015 expenses to remain at $6.427 billion. But in that scenario, the real pain is simply delayed until FY 2016 (see below). The FY 2016 beginning balance will be zero under almost any scenario. Estimated revenue totals $5.811 billion. That means, without more revenue, there will be $5.811 billion to spend. That’s it. 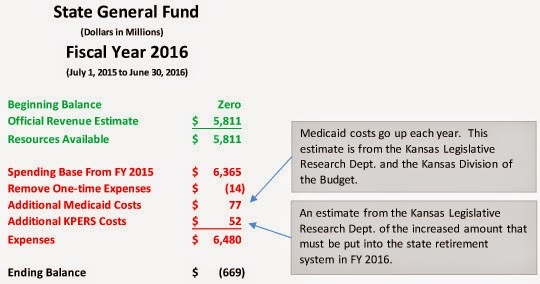 In FY 2016, some one-time expenditures can be taken out of the spending base, but the state will face new costs for Medicaid and KPERS, pushing expenses above $6.5 billion, and creating a more than $700 million imbalance. In FY 2017, the official revenue estimate totals $5.877 billion. New Medicaid and KPERS costs will keep coming. Here’s what lawmakers cannot escape: Current expenses are more than $6.4 billion a year and rising. Without new, ongoing revenue, that set of growing expenses must somehow be whittled down and made to fit within a revenue stream that appears to be roughly $5.8 billion per year and staying relatively flat. Kansas had better figure out a way to get some more revenue, or a lot of program cuts lie ahead. 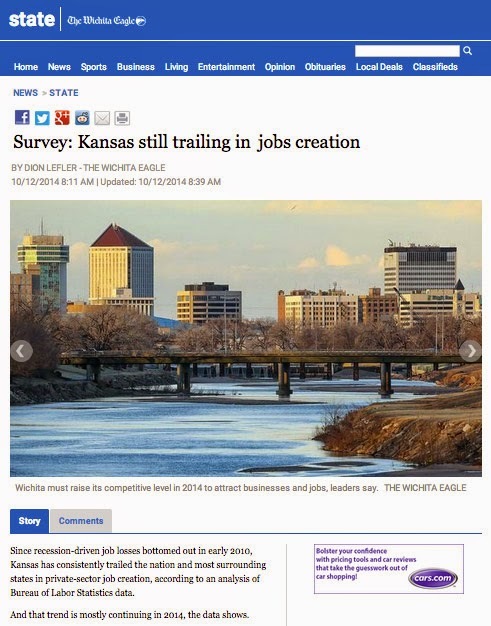 Readers: The Kansas Budget Blog will take a holiday break. Watch for new posts in early January. Thanks for reading! And Happy Holidays! Click on this link. Spend a few moments watching the ticker there. If you clicked, you saw dollars, fleeting before your eyes. Those dollars are fleeting away from Kansas because our political leaders have so far said “no” to expanding eligibility for Medicaid. Their decision has negative economic and negative moral implications. Medicaid is a health program for low-income Americans. In Kansas, about 400,000 citizens, mostly children, receive health services through Medicaid. 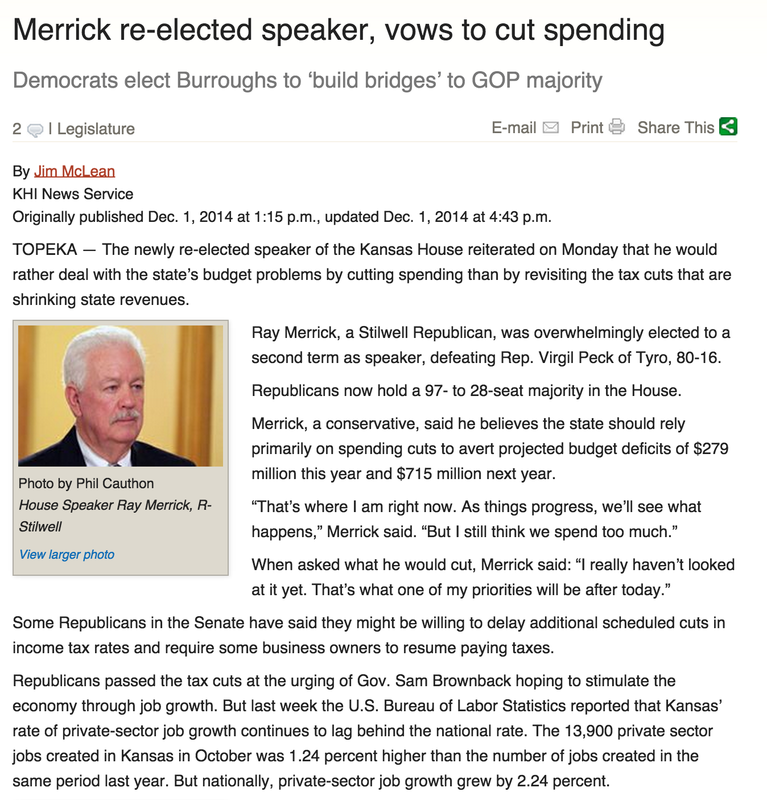 The federal government pays about 57 percent of the program's cost and Kansas pays 43 percent. However, if Kansas were to expand eligibility for Medicaid to more adults, the federal government will pay all of the costs for those newly eligible, until January 2017. 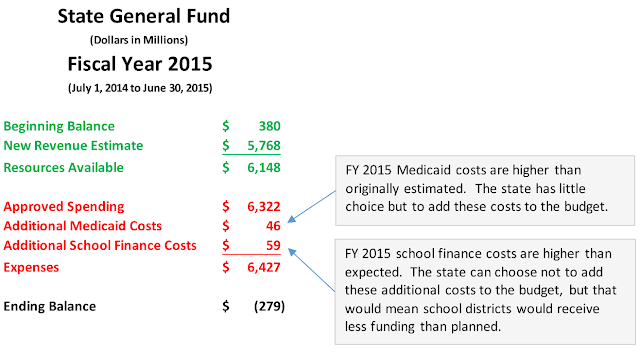 After that, the cost split gradually goes to 90 percent federal, 10 percent state. This new opportunity to cover more people began last January 1, and as that ticker shows, in less than a year, Kansas has already foregone more than $300 million and counting. 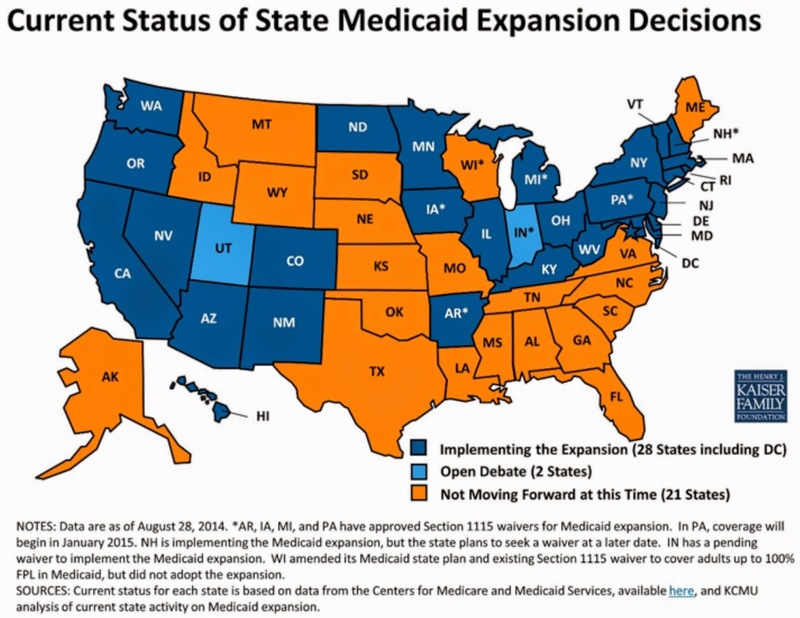 More than half of states — 27 — so far have expanded Medicaid eligibility. Two more are actively considering doing so. Kansas is among the minority who have declined these federal funds to insure our most vulnerable citizens, but we still have the opportunity to change course. Despite what many may think, it’s currently very difficult for an adult to receive Medicaid services in Kansas. Most childless adults do not qualify, regardless of income. Adults with children must have an annual income (family of four) below $9,063 to qualify. Expanding eligibility would potentially allow 150,000 adults to gain access to health care, many of whom do not have any health insurance now. Uninsured Kansans often show up at hospital emergency rooms when they need care. The hospital provides the care, but in most cases receives no payment. Why would Kansas turn away $400 million a year that the federal government would willingly spend here? Why would Kansas pass on the opportunity to have thousands of people gain health insurance coverage? I cannot think of a good reason. Consider a comparative example: Kansas political leaders from both parties have worked exceptionally hard to land the National Bio and Agro-defense Facility (NBAF) in Kansas. The project has the potential to bring in some hundreds of millions of federal construction dollars along with several hundred future jobs. Kansas has already issued $45 million in bonds and committed more than $100 million to attract the federal project. Great — but why not a similar effort to pull in an even greater amount of federal dollars and to give health insurance and peace of mind to fellow Kansans? 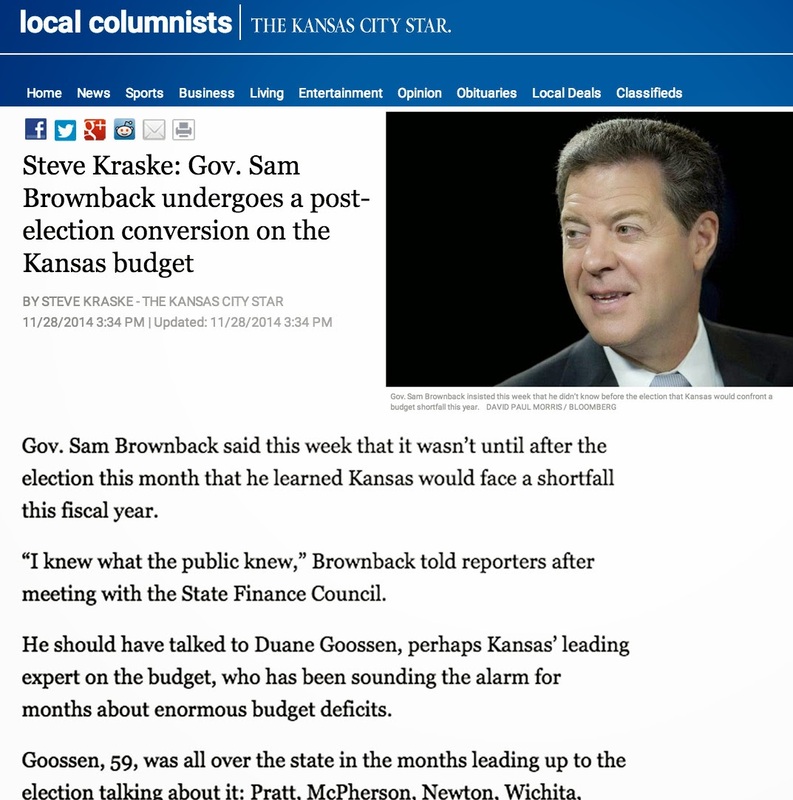 The Kansas budget is in trouble — now. The revenue stream has fallen so low that it no longer supports even a lean set of expenses. Expanding Medicaid eligibility would not add to the short-term problems. However, tragically, our self-imposed budget crisis has put our lawmakers in such a defensive posture that it’s a hard sell to agree to a future 10 percent match in order to attract $400 million now and each year going forward. Break out of this crippling mindset, Kansas. Don't miss the opportunity to benefit our economy, Kansas hospitals, and uninsured Kansas citizens. Say "yes" to Medicaid expansion. If you own a car, you know there are a bunch things to pay for: taxes and tags, insurance, oil changes, tires, and probably monthly installment payments. You also have to buy gas. Even if you spend a lot of money on those other things, without gas the car won’t go far. The same is true for public schools in Kansas. Producing high quality education requires buildings, computers, school lunches, and a retirement program for teachers. But it also requires classroom operating funds — the gas. Over the last six years, Kansas has let up on the gas for education, and the danger of more cuts is now quite high. The best measure for judging whether Kansas is letting up or pushing down on the education gas pedal is Base Aid Per Pupil (BAPP). The main operating budget of each school district is determined by BAPP multiplied by the number of students. That basic budget is funded by a 20 mill statewide property tax levy which raises just under $600 million in FY 2015, and by “general state aid” from the Kansas general fund. During the past six years, the amount of money for general state aid has decreased, while the number of pupils has increased, leaving the BAPP $548 — or 12 percent — lower than it was in 2009. 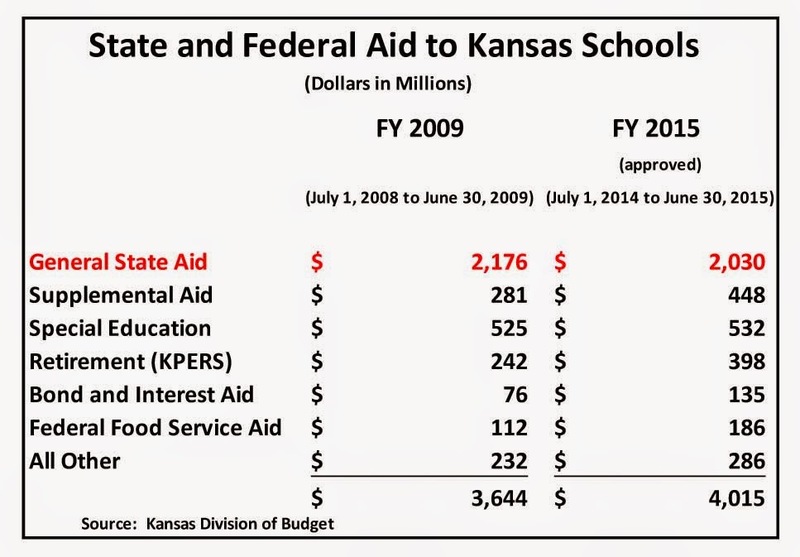 The chart below lists the major areas of school funding provided by Kansas and the federal government. The first line shows the General State Aid drop. Note that some areas of school funding have gone up, which has enabled Gov. 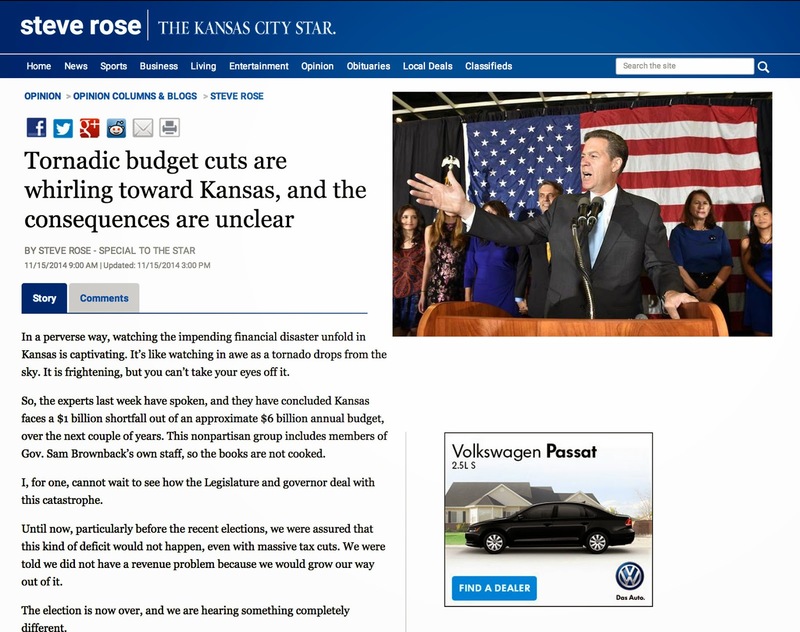 Brownback to claim that total school funding is growing, even though the critical money for “gas” has been cut. 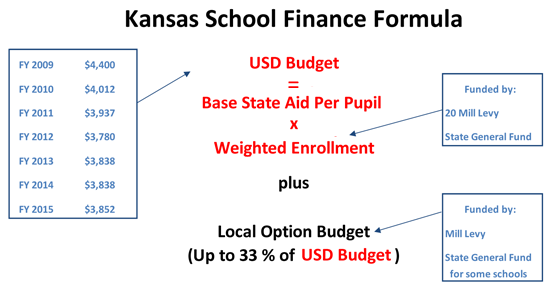 Last spring the Kansas Supreme Court ordered lawmakers to increase Supplemental Aid, which provides a partial match to local property taxes to help less wealthy school districts fund local option budgets. Federal rules require Special Education to be maintained at minimum levels. The state pays the employer share of Retirement costs for teachers and must increase that amount each year. Some school districts receive state Bond and Interest Aid to help make loan payments on buildings, a promise to those districts that cannot be easily broken. Lawmakers do have discretion over general state aid, and they have chosen to let it decline. The result: classroom sizes are growing and Kansas districts are less able to competitively attract and retain high-caliber teachers. As the budget debates heat up, keep your eye on Base Aid Per Pupil — the gas that runs the education system. Simply maintaining the present level is not good enough, especially given that the BAPP has fallen for years while classroom sizes have grown. For the future of our state, our governor and legislators should be pushing the BAPP back up. 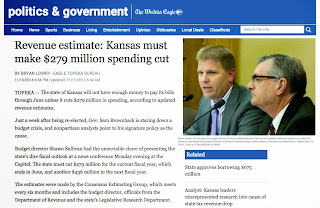 It is now official: Kansas must make deep budget cuts yet this fiscal year just to stay financially solvent. The state’s revenue estimators met Nov. 10 and significantly lowered the official outlook for the amount of income that Kansas is expected to receive. The new forecast released yesterday shows receipts far below expenses. First, look at fiscal year 2015. Expected revenue — plus the beginning balance in the state bank account — total $6.148 billion. 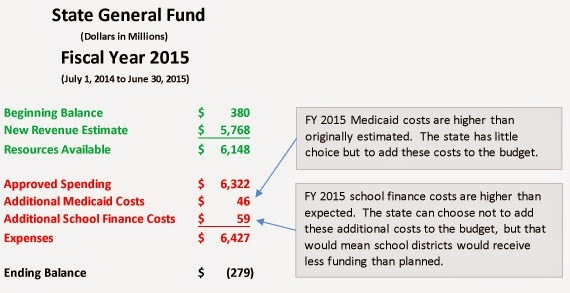 Approved spending plus additional costs required to pay for Medicaid and school finance total $6.427 billion. Even after completely draining the reserves in the state bank account, $279 million must still be cut from already approved spending just to keep the state solvent. However, that's a small problem compared to the next two years. But what is the official forecasted revenue for FY 2016 from yesterday's report? $5.811 billion. For FY 2017? $5.877 billion. Remember: current expenses are $6.427 billion. Costs are growing. Revenue is falling. And even more tax cuts are scheduled to take effect. It’s not possible to sugarcoat this. The current set of Kansas services must be dramatically downsized. Here’s the saddest part: Everyone is now on defense. Advocates for public education, higher education, human service programs, public safety, and highways will all be working hard to defend what they have. All of the state’s political energy will go toward figuring out how to constrict and pull back. 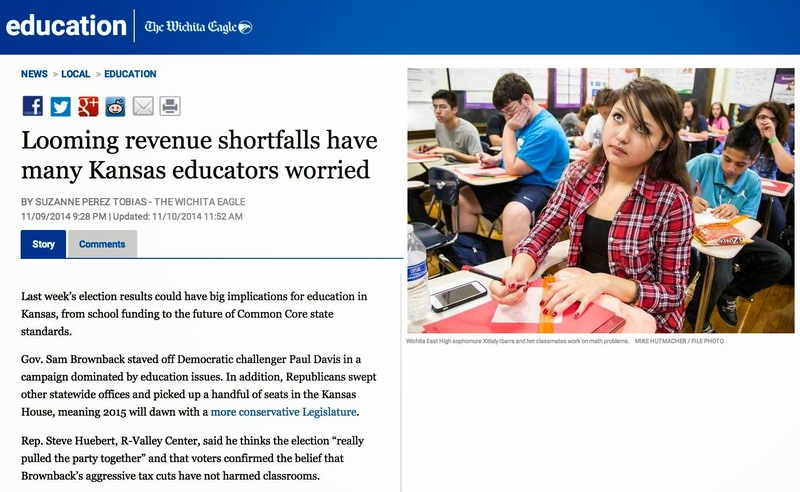 No one will be thinking about things like offering a world-class education to Kansas students or otherwise investing in the state's future. Remember how state revenue plummeted in April, May, and June? Well, we finally have information that compares the Kansas experience to that of other states. No other state dropped as far as we did — yet more evidence that Kansas is out on its own at the very end of the spectrum. The Rockefeller Institute of Government — the go-to source for information about state revenue collections — just issued numbers on what happened across states in the April-May-June quarter. 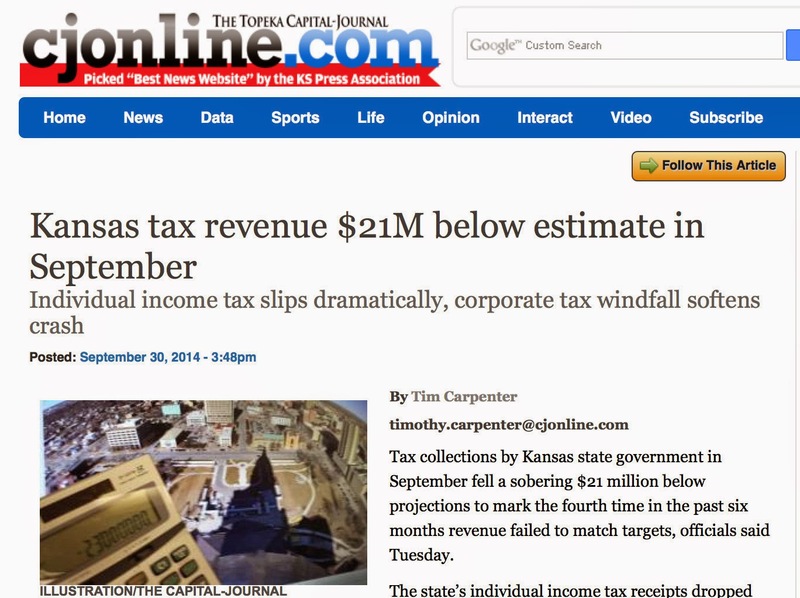 Kansas income tax collections came in 43 percent below the same period a year earlier. We already knew that, but we did not know how Kansas compared to the rest of the nation. 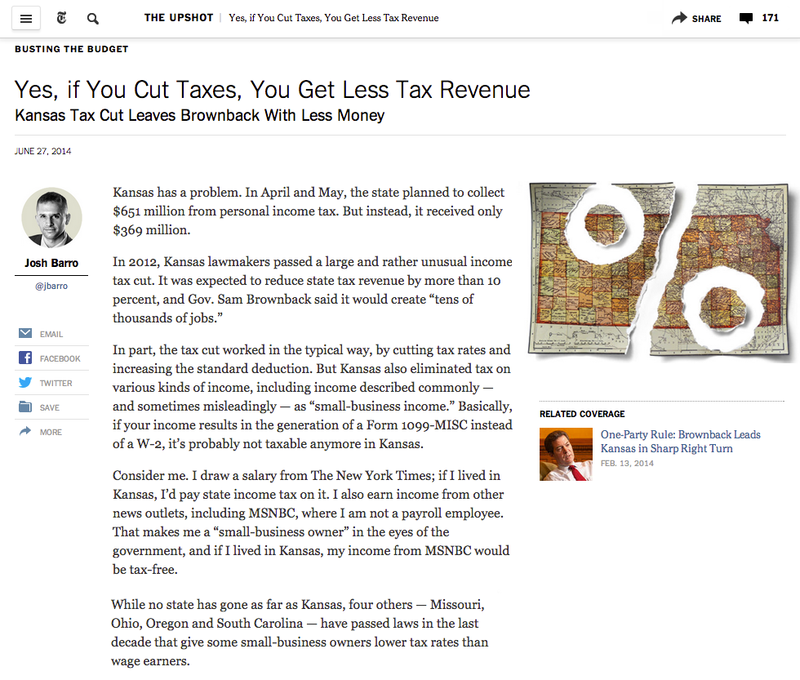 The answer: Kansas had the steepest drop of all states in both individual income tax and in combined revenue. Nationally, the average income tax decline was 7.1 percent. Income tax collections in most states went down somewhat, confirming that the timing of capital gains income likely played a small part in the Kansas decline. However, given that the Kansas drop-off was comparatively so large, these new numbers clearly show that the Kansas decline had far more to do with tax policy changes. The Kansas Department of Revenue wanted us to believe the drop in that period was all about capital gains, when it simply was not. That should make reporters and everyone else very cautious about taking at face value what the Department says, particularly as reports about September revenue collections emerge. The Department has political incentive to make the September numbers look as high as possible, and has been working to settle outstanding tax collection cases — so watch carefully for one-time receipts that are counted into the total. Also: watch carefully what the state does with revenue transfers. Delaying scheduled transfers makes monthly revenue appear higher, but only temporarily. Kansas revenue went down $688 million in fiscal year 2014 and it's staying down at that level now during FY 2015. More income tax rate reductions are scheduled to kick in all the way through 2018, further depressing receipts. Revenue no longer comes close to covering expenses. The dramatic changes in Kansas tax policy have caused budget problems and service reductions, but so far the effect has been softened by spending down the state bank account to cover the difference between revenue and expense. The bank account will be gone within this fiscal year. The most profound consequences of Gov. 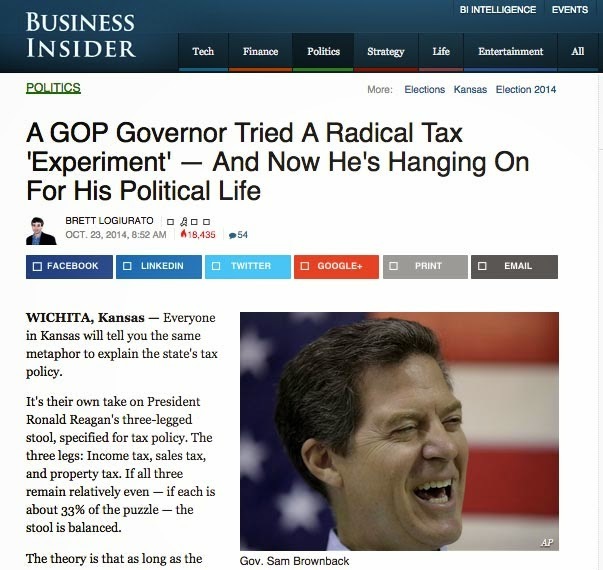 Brownback's tax policy are still yet to come. Kansans like things that are fair, practical, and commonsense — but those words don't describe Gov. 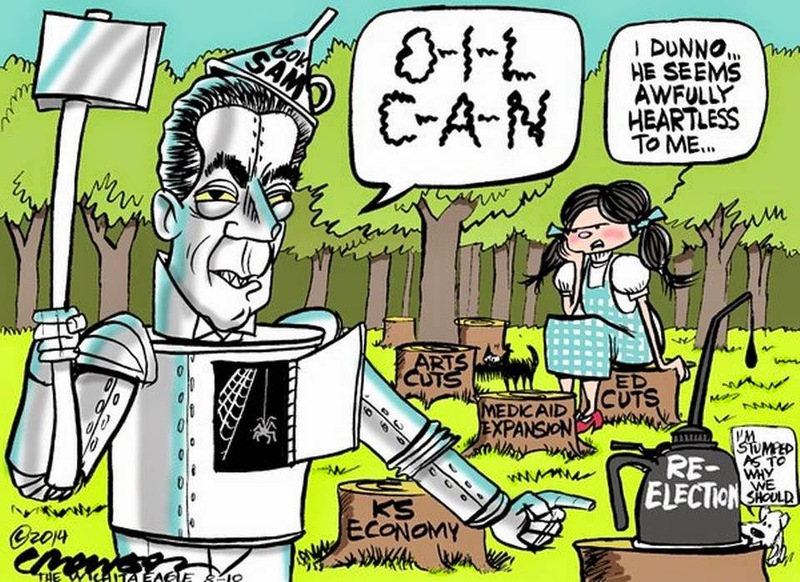 Sam Brownback’s tax plan. Low-income Kansans pay more. The wealthiest Kansans receive a huge break without any requirement to keep their newfound tax savings in Kansas. The resulting revenue shortfall has put the state budget on a path to default. The governor’s tax plan, which passed the Kansas Legislature in two phases, simultaneously decreases some taxes and raises others. The net effect is a dramatic reduction in state revenue. 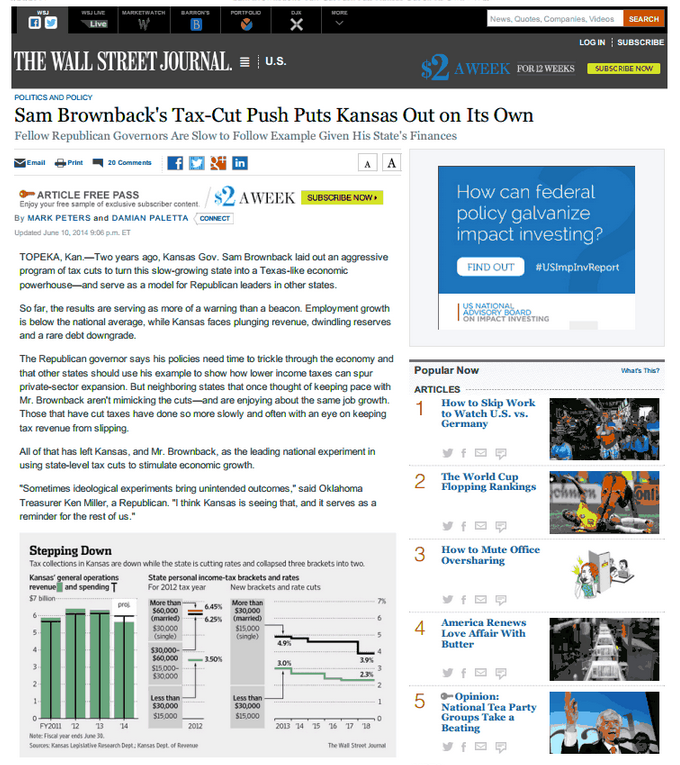 Kansans do not benefit from the tax changes equally. 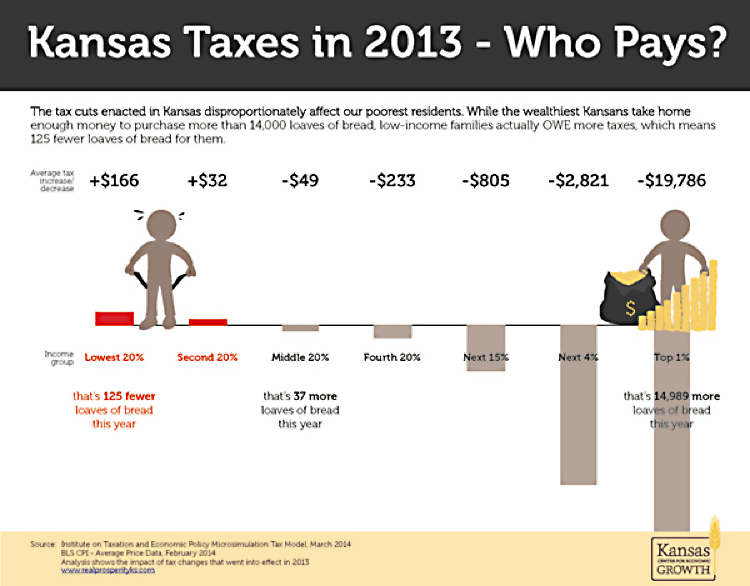 A revealing graphic from the Kansas Center for Economic Growth shows who paid and who benefitted in tax year 2013, the first year of the plan. 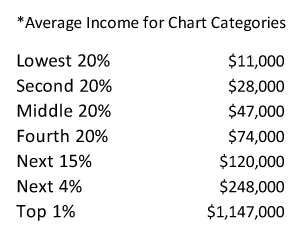 Middle income Kansans receive the income tax rate cut, but their income tax deductions are limited, and they pay more in sales tax than they otherwise would have. Their net outcome is a slight reduction in overall tax payments that many likely did not notice. 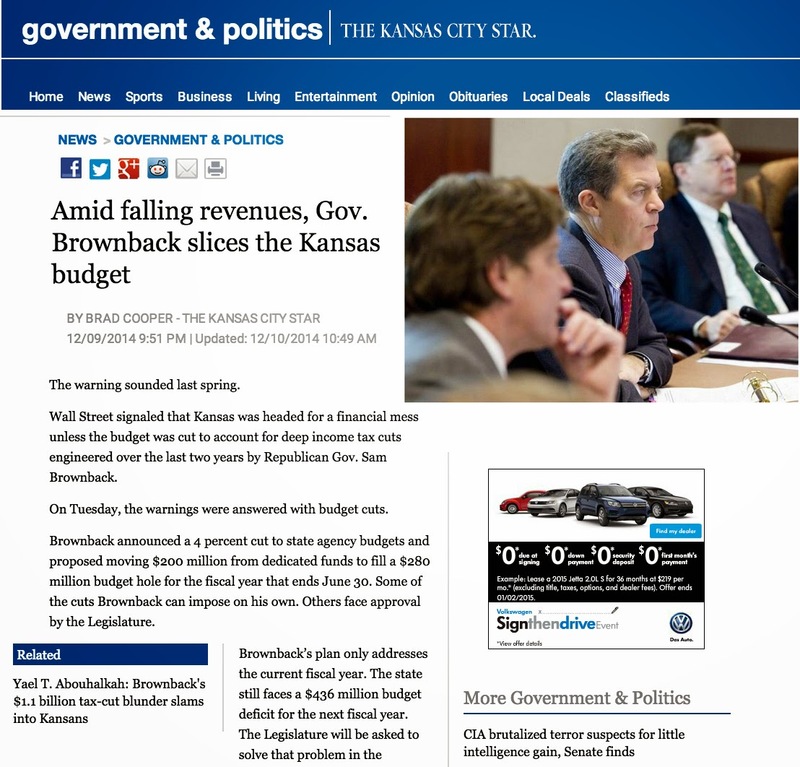 All Kansans bear the brunt of the state budget problems that are now playing out because revenue has dropped so dramatically. K-12 education has been hurt by reduced funding to classrooms. Human service programs have been cut. The Highway Fund has been tapped to pay for other things. And even still, the budget does not balance. Don’t be misled by campaign season rhetoric. 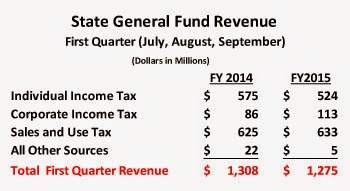 Income to the State General Fund (SGF) remains critically low. As a result, Kansas is headed toward current year spending cuts that will affect education and other key programs. 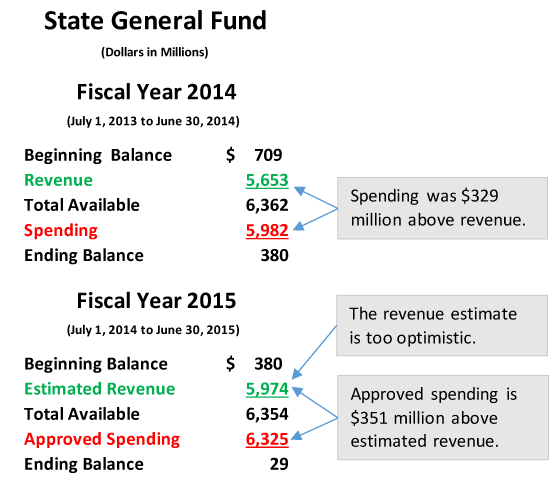 Here’s the summary: In FY 2014, SGF revenue dropped dramatically — $688 million from the previous fiscal year. In order for the SGF to barely stay solvent this fiscal year, revenue must rebound by $300 million. If revenue does not grow, spending will have to be cut. After the first two months of FY 2015, receipts are below the FY 2014 level. Revenue went way down in the last fiscal year, and is staying down. 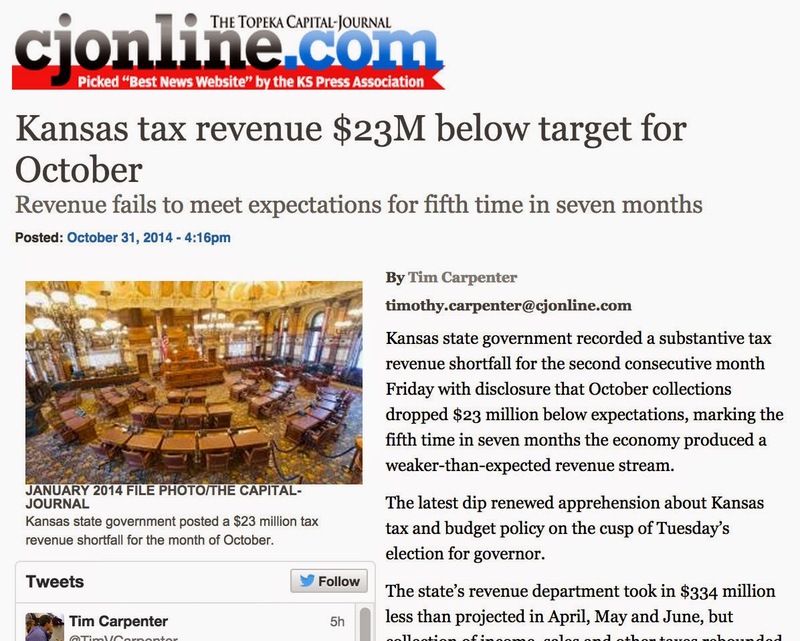 The Kansas City Star was on the mark with its September 2 editorial about revenue collections. For readers who want to dig deeper into the numbers: Look first at the current FY 2015 SGF budget summary below. 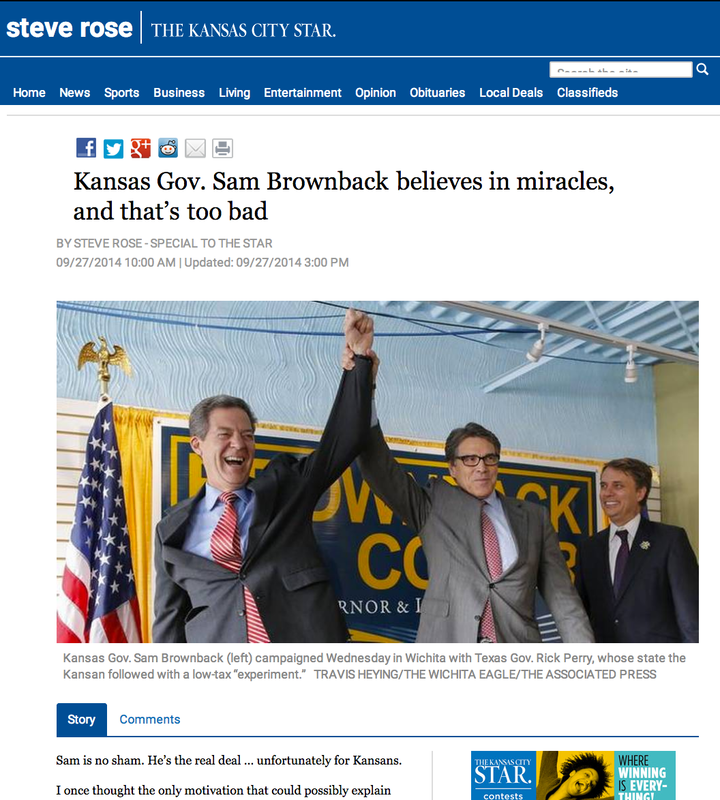 Kansas began FY 2015 two months ago with $380 million in the bank. The official revenue estimate of $5.974 billion (established last April with incomplete information about individual income tax receipts) is $321 million higher than the amount received in FY 2014. Approved spending has been set $351 million above the optimistic revenue estimate. Even if the revenue estimate somehow comes true, the state will end FY 2015 with a dangerously low $29 million bank balance. Now look at the figures below comparing receipts from the first two months of FY 2015 to that same period in FY 2014. Revenue is flat and not on track to grow. In fact, the FY 2015 amount of $764 million is artificially high because $34 million in transfers — transactions that reduce revenue — were not made as planned in August, and instead will reduce revenue in some future month. Revenue during September is likely to follow the same pattern. For taxpayers making quarterly income tax payments, the third quarterly installment is due in September. Quarterly payment amounts in April and June were significantly below previous years. Low quarterly payments in September could easily cancel revenue gains that might come from sales tax or corporate income tax. FY 2015 looks bad, but it’s only a warm-up for FY 2016. Expenses will keep growing, but even more income tax rate cuts are set to take effect all the way through 2018. The governor’s tax plan has produced a dismal outlook for the State General Fund. I was struck by the recent comment of a University of Kansas official: “Flat is the new up.” He was referring to state funding for Kansas higher education, and the now diminished hope for what the state can provide. He’s right, of course. 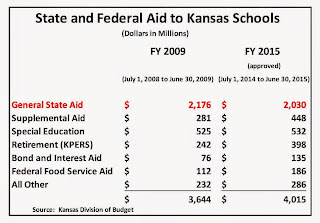 Flat funding is the best that the Kansas higher education system can expect. But even that has become a high bar and an unlikely outcome. In actual dollars, state funding for higher education reached a high in fiscal year (FY) 2008, then took a big hit during the Great Recession and has floundered since. As the chart shows, support goes up $28 million in the approved FY 2015 budget, but before getting too excited about that, consider that the FY 2015 amount — $794.1 million — is $35 million less than 7 years earlier. Is the FY 2015 appropriation even realistic? Can state support grow enough to get back to where it once was? Revenue to the State General Fund has been reduced so severely that spending in the approved FY 2015 state budget is $351 million above expected income. If revenue comes in as estimated, the SGF can just barely stay solvent by using up the remaining balance in the state bank account. However, the official revenue estimate was completed last April with incomplete information and is far too optimistic. 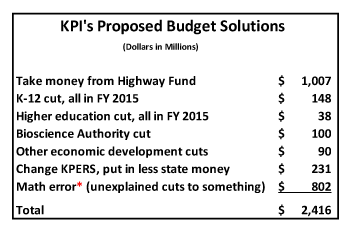 A much more likely scenario requires current fiscal year spending cuts. For FY 2016 and beyond, the state faces a situation in which the revenue stream will be hundreds of millions below current spending levels. Unavoidable expenses like Medicaid will continue to rise, even as more income tax rate reductions take effect and further restrict revenue. State finances are badly out of balance. Something will have to give way. Get a grip, Regents! You are headed down a rocky path. The current set of state policies has made your state support anemic, and will hurt higher education even more in future budgets. Watch out, students and parents! The direct result of declining state support is higher tuition and more fees. That’s been happening, and it will get worse. Brace yourselves, Kansans! We have had a higher education system that we can be proud of, but that won’t last if we do not nurture and invest in it.